In 2006, on the occasion of the 800-year anniversary of the Saxonian capital Dresden a web presentation of selected maps and historical vedute stored in the Saxonian State- and University Library – Sächsische Landesbibliothek, Staats- und Universitätsbibliothek (SLUB) in Dresden, Germany, was initiated. Since then this digital map collection named “Kartenforum Sachsen” (“Map Forum Saxony”) has been significantly extended.This map forum represents an information portal of both the Saxon and foreign libraries, museums and archives managed by the Deutsche Fotothek (German Photothek) of SLUB. 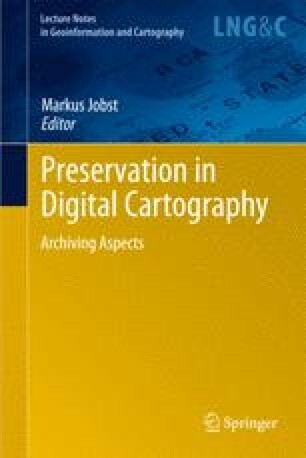 Currently it offers roughly 5,300 of the most important historical cartographic media (maps and vedute) of all involved collections. The digitising needs highest resolution requirements. The article describes the analog/digital conversion of the originals, data processing (by means of Zoomify), its zooming and scrolling possibilities. The further extension of the “map forum” is currently on the way until 2011 within the scope a project funded by the German Research Council (DFG). E. a. it is planned to realise the map-based searching for larger maps and map series by means of an open standard interface (Google Maps API). Klemp, E 1996, Die Erfassung von Altkarten in der IKAR-Datenbank – gegenwärtiger Stand und künftige Entwicklungsmöglichkeiten. 7. Kartographiehistorisches Colloquium Duisburg, 1994. Vorträge und Berichte (= Duisburger Forschungen, vol. 42), Duisburg, pp. 225-232 (cf. http://ikar.sbb.spk-berlin.de).